Legionaire Fishing Charters is based in Thames in the sunny Coromandel region. Renowned for its pristine waters and fabulous beaches, Thames offers great fishing as well as a fantastic holiday getaway to enjoy the great outdoors. Bob is a well known and highly experienced charter operator and provides a great day out for that special occasion or for individuals wanting the opportunity to catch some big fish. 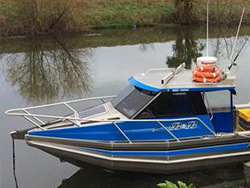 His charter boat is fully equipped to have up to six anglers on board comfortably and is surveyed as per Maritime New Zealand's requirements. To make an enquiry, please contact us or Bob on 027 242 0924. 672 Thames Coast Road, Waiomu Thames. Need directions?